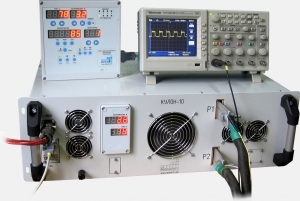 This power supply is a specialized modification module «KULON» optimized to work with the "fast" and consisting of many phases of the electroplating process. Software of the controller power supply was substantially modified to provide high temporal resolution for managing power electronics. 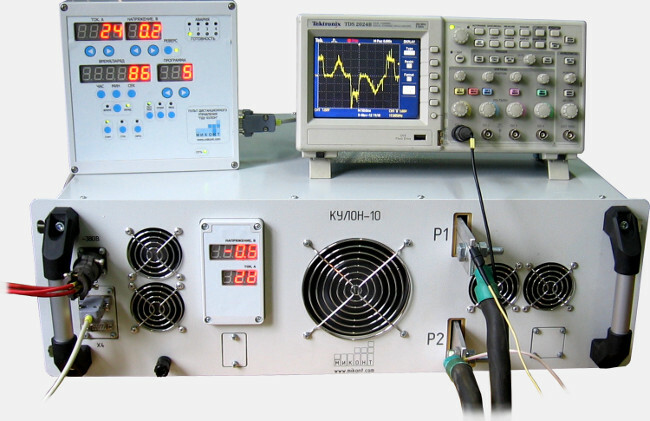 According to test results, the power supply allows you to create sequences output voltage with discreteness of 10 ms per operation and inverts the output voltage of 4 ms. Programming sequences performed by the operator remote control (shown in photo). At the top of the photo - the sequence diagram in the form of a meander with a pulse duration of 10 ms.
At the bottom of the photo - the sequence diagram of rectangular and triangular pulses of different polarity and duration of 10 >ms. On the remote control displays the current value of the output current, output voltage, ampere-hours counter and the current step patterns.